A bumper crop today...you've outdone yourselves! "Here was my daily affirmation that I am no longer a teenager. 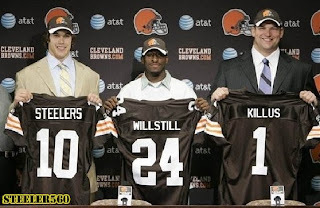 Notice the before and after photos...To loosely tie this into the sports world... 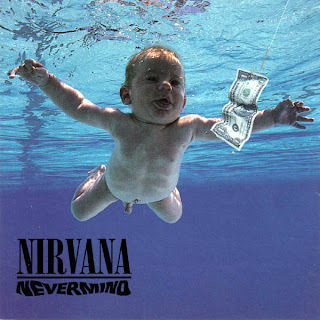 The album was released on September 24th, 1991. That kid was 3 months old when the photo was taken. He has absolutely no concept that the Pirates have ever been a winning baseball team. So yes... whether it works or not, the walkout is a great idea." --Aaron Gray joins Joakim Noah on the Chicago Bulls. Would have been nice if the Grayzilla could've cracked the first round...or gone higher than 49th, for that matter. --Bugs and Cranks says it's time for Dave Littlefield to take a hint from the WWE and fake his own death. I agree. --Read this article about Padres pitcher Chris Young. And then remember that the Pirates traded him for Matt Herges. --The Pittsburgh Riverhounds could be moving to Pittsburgh Mills. If you didn't notice, the Riverhounds didn't play last year. Guess what? I didn't notice. --American Memorabilia is selling Dock Ellis signed baseballs with the inscription, "I threw a no-hitter on LSD." 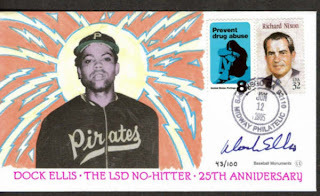 That would seem to go against this Ellis collectible from a few years back with the "Prevent Drug Abuse" stamp. --Remember Panther Rants, the popular Pitt sports-based blog? Well, it's been taken over, and it's described as "The Onion of Pitt Sports". --The rare "five star recommendation" goes to this video of MSNBC news anchor Mika Brzezinski absolutely losing it for having to lead the news with Paris Hilton. --Hey, it's the Kobe video! --Takeru "Tsunami" Kobayashi has pulled out of this year's Hot Dog eating contest on the Fourth of July. He obviously heard Joey Chestnut's footsteps. --"What was Ben's squeeze, Missy Peregrym, doing last weekend in Vegas while he was mourning the death of his former coach in Indiana?" Guess you'll have to click the link to find out. --From the "No Joke Necessary" Department (a department that's been getting a lot of action lately): "Man mistakes straw bale for stricken woman, gives it CPR"
--Pick one: Jerome Bettis or Franco Harris. --The Pirates have Saturday night WALKOuts, the Padres have the controversial "Pride Night". --Former New Kid Donnie Wahlberg is in town with the filming of Spike TV's "Kill Point". --ESPN and Woody Paige are sued for sexual harrassment. --The Atlanta Center for Disease Control is issuing trading cards of science and health. Anthrax rookie card, anyone? --The Spice Girls are back! Who are the four frumps and scary anorexic chick you have posted under the Spice Girls link? Girl power! I reposted the picture of the Nevermind kid on as a bulletin on my myspace page. People are emailing me shocked about it for some reason. No one can comprehend that the naked Nevermind baby can probably drive now. Scary Spice isn't so scary anymore!